While I don’t go the full distance with the exclusive role (“any other vehicle”) endowed to “literature” here, I agree that literary works are a powerful medium and can historicize and humanize supposedly “aberrant” phenomena like “terrorism.” In this sense, anthologies like the one edited by Majumdar can re-emphasize the importance of literature in a conjuncture where postcolonial thinkers like Achille Mbembe (2008) are calling for a move beyond literature. After Majumdar’s lengthy introduction, The Other Side of Terror is divided into three major sections. The first section is titled “Freedom and Terror,” the second “Revolution and Terror,” while “Identity and Terror” closes the book. An implicit trajectory can be discerned as we move from anticolonial nationalist texts (exclusively from India) to post-colonial revolutionary violence primarily of the Maoist variety (the two locations explored here are India and Nepal) and, finally, post-colonial identity-based “terror” landscapes (this section focuses on Sri Lanka, Punjab, Kashmir and the Indian “North-East”). This implicit trajectory attacks the naturalization of the Huntingtonian thesis of the “clash of civilizations” in the contemporary global conjuncture. The critique of the “clash of civilizations” merges with Majumdar’s defense of “literature” which we have already come across in the paragraph above. 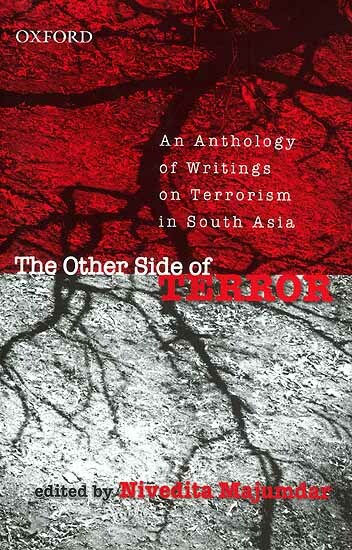 Sundar’s comment about the anthology aiming to provide an “alternative genealogy” to the subject of terror captures the real thrust of Majumdar’s attempt at critiquing the simplistic culturalist model deployed all-too-frequently nowadays in relation to the multi-faceted phenomenon of “terrorism.” This alternative genealogy emerges from the South Asian histories of the colonial and post-colonial periods. However, it should be noted that not all of South Asia is represented in the volume. Literature from Pakistan, Bangladesh, Bhutan and the Maldives are notable by their absence. The first section of the anthology juxtaposes writings by South Asian literary luminaries like Bankim Chandra Chattopadhyay, Sarat Chandra Chattopadhyay and Rabindranath Tagore with essays and tracts written by Bhagat Singh, Bal Gangadhar Tilak and others. Majumdar initiates a conversation between some of the texts represented in this section — something which is not very evident in the other two sections. A good example is her discussion on the connections between Sarat Chandra’s Pather Dabi and Tagore’s Char Adhyay towards the end of her introduction (xxxviii-xxxix). In the second section on revolution and terror, the selections tend to veer more towards the literary side in the subsection titled “India.” The works selected here are primarily responses to Naxalite violence and its repression, and includes fictions by Mahasweta Devi and Ashim Ray with poetry by Tarit Kumar and Saroj Dutta. In the subsection titled “Nepal,” we have one fictional work by Samrat Upadhyay, one poem by Sushma Joshi and essays by Li Onesto and Pankaj Mishra. A real oddity in this subsection, however, is the inclusion of a poem by the India-based Tibetan activist, Tenzin Tsundue. “Identity and Terror” is divided into four subsections: “Sri Lanka,” “Punjab,” “The North-East” and “Kashmir.” “Sri Lanka” has poems by Cheran and Jesuraja and fiction by Jean Arasanayagam and A.V. Sivanandan [Majumdar says that Sivanandan’s “magnificent novel, When Memory Dies… is the inspiration behind this book” (xi)]. “Punjab” has a poem by Pash, fiction by Anita Agnihotri, Mohan Bhandari and Kartar Singh Duggal, and portions from Khushwant Singh’s memoir My Bleeding Punjab. The subsection titled “The North-East” contains poems by Robin Ngangom, Mamang Dai, Kynpham Sing Nongkynrih and a few others, fiction by Bimal Singha and Mitra Phukan and essays by Sanjib Baruah and Ngangom. Finally, “Kashmir” has fiction by Anees Hamadani and Somnath Zutshi, a personal essay by Neerja Mattoo, and an essay on the faces of women from conflict-ridden Kashmir by Sheba Chhachhi. I commend Majumdar’s effort at bringing works from disparate contexts in South Asia under a common umbrella. From a “teacherly” standpoint, this text can be an effective pedagogical tool as it brings writers as disparate as Sarat Chandra, Jean Arasanayagam, Sushma Joshi and Bimal Singha together. The translations of the non-English texts are also very readable. I think students and researchers on “terror” will find the translations pretty easy to follow. However, this anthology has several flaws at the level of organization besides the obvious mistake of including Tsundue in the section on “Nepal.” Instead of wasting too much ink on what should or should not have been included, my concern in this essay is with certain organizational and conceptual flaws in the anthology. Thus, I am interested not in the “why” (or “why not”) of the selection process, but on the “how(s)” that predicate Majumdar’s presentation of the material. Savyasachi’s declamation here inserts the advocacy of a locally-rooted anti-colonial form of violent, political action within a “global” chain specific to its time — Hungary, Russia, France and, possibly, Japan. Given that Majumdar’s introduction is titled “Many Sides of Terror,” would it not have been more effective to allow multiple “spectres of comparison” (Benedict Anderson’s phrase) to interrupt the overweening nature of the “event” of 9/11? Is 9/11 the only organizing sign we possess to understand the multiple manifestations of “terrorism”? If the answer is yes, then our conceptual and narrative frameworks are very limited indeed. The reductive tendency is also evident in Majmudar’s exploration of terms like “terrorism” and “unlawful combatant.” For Majumdar, the pre-eminence of “terrorism” as a term is a “novel phenomenon”— a “novelty” presumably arising in a post-9/11 context. Although she gives us a panoramic sweep of terrorisms through history in the first two pages of her introduction, she ends this section by saying that terrorism has “special resonance in the twentieth century with its anti-colonial movements and state offensives across the world…” (xiv). However, drawing deeper connections between anti-colonial movements and its possible resonances with 9/11 and its aftermath would have been very helpful for the reader; a point I will return to later. Instead, Majumdar’s introduction jumps from this brief mention of anti-colonial terror to the (post) 9/11 context. This jarring tendency to“jump cut” from one topic to another is also noticeable in Majumdar’s transition from the second section titled “Violence and Dissent” to the third section that contextualizes “terrorism” within a colonial and post-colonial South Asian context. Several questions arise in the mind of the reader which are not adequately addressed in the introduction: How does the South Asian scenario shed light on the “global” 9/11 context? Is the answer simply that “we” in South Asia have a treasure trove of literary works dealing with the “other” side of terror? If that is so, this argument can be extended to any geographical locale scarred by state and non-state forms of terror. What is specifically unique, and at the same time, “global” about the South Asian experiences of terror? Majumdar also spends a lot of time on state terror in her introduction. It is surprising though that she does not include many works dealing with the impact of state violence on ordinary lives. Notable absentees in this regard are works dealing with the events of 1971 in Bangladesh or, for that matter, literature on terror in post-colonial Pakistan. A clarification again: I am not critiquing Majumdar because she ought to be more inclusive in her anthology (she probably should in any case!). However, I am critiquing Majumdar for not following the different nuances of the term “terrorism”— some of which, like the connection between security and liberty, are explored astutely in her introduction — in her selection of texts. State terror, whether of the colonial or post-colonial variants, the terror wrought upon ordinary people when two neighboring states wage war against each other, and other such instances of state-legitimized terror also fall within the purview of Majumdar’s “provisional” definition of terrorism — “the use of violence to achieve political ends, taking note of the fact that political ends are generally claimed and also acknowledged to be legitimate ends” (xii-xiv). Both state “terror” and the associated term, “counter-terrorism,” are encompassed by this definition. While Majumdar makes astute observations about the security-complex of modern nation-states and its tendency to curtail civil liberties during states of emergency (see especially xvi), one wishes that there were a better representation or at least the inclusion of literary works that illustrate the psycho-social impact of state-legitimized forms of terror on ordinary lives. I also dispute Majumdar’s claim that terms like “unlawful combatant” represent something that “holds no meaning in international law” (xvi). Terms like “unlawful combatant” did not emerge spontaneously into the international scene. They have had a fuzzy historico-legal existence for a while. Two of Carl Schmitt’s later books — The Nomos of the Earth (2006) and The Theory of the Partisan (2007) — show us that there is a specific historical genealogy for the category of the “unlawful combatant.” While the “lawful” enemy is more often than not the uniformed soldier of a specific nation-state who is guaranteed certain protections under international law, the partisan is an early analogue of the figure of the “unlawful combatant.” Initially, the partisan, like the figures of the “bandit” or the “pirate” earlier, was considered to be outside the law. Legally, the change in the status of the partisan can be noticed in the 1907 Hague Convention. Here, for the first time, the partisan enters the domain of the law as a political figure. According to Article 3, Section 4 of the Convention, the irregular fighter is no longer “outside the law,” but is now equivalent to a criminal according to ordinary law (The Theory of the Partisan, 24-25). By the time of the Geneva Convention of 1949, the political character of the partisan became even more sharply defined. Articles 4 and 13 of the Convention widened the circle of persons equated with regular soldiers to members of organized resistance movements. Organized resistance fighters are here equated with volunteers and are supposed to be given the same humane treatment as the combatant in “lawful” uniform. We must carry the war into every corner the enemy happens to carry it: to his home, to his centers of entertainment; a total war. It is necessary to prevent him from having a moment of peace, a quiet moment outside his barracks or even inside; we must attack him wherever he may be; make him feel like a cornered beast wherever he may move. Finally, I criticize the disjunct between Majumdar’s use of the term “literature” and the actual selections made in her collection. As I mentioned earlier, I support Majumdar’s defense of literature, even though I don’t go the full distance with her claims about its “exclusive” character. While she has an impressive list of well-known and relatively unknown literary pieces in her anthology, she often intersperses them with tracts by anti-colonial thinkers like Aurobindo or Bhagat Singh, critical essays by social scientists like Sanjib Baruah and non-fiction or journalistic essays by writers like Pankaj Mishra. I assume that “literature” is Majumdar’s primary focus since she devotes an entire section in her introduction to this category. But, how are we supposed to read the non-literary pieces? Let me take the sub-section titled “The North-East” as an example. This section begins with the political scientist Sanjib Baruah’s essay on the “new politics of race” that defines a certain relationship between India and its northeastern region. Does this essay provide a historical and social “background” to the struggles in the northeastern region? Moreover, if we flip back to her brief description of the issues in the northeastern region in the introduction (xxvii-xxix), there is hardly any mention of racial politics. Instead, we come across the following sentence: “The North-east never benefited from an enlightened perspective that would both integrate it with the rest of the nation and nurture its unique culture” (xxvii). The “North-East,” an “unfortunate directional category” as Barbora (2008) so accurately describes it, is a place with heterogeneous cultures. Basing our judgment on Majumdar’s way of organizing texts in the section, are we to assume a close relation of the “new politics of race” to the “unique culture” (note the singular form) of the region? Is the category of “race” the primary determinant of “identity” politics in the region? Do we use Baruah’s non-literary work as an optic to read the divergent literary works by Nongkynrih, Dai and Singha? It would have been very helpful if Majumdar provided a rationale for her selection of non-literary texts and her method of organization. Maybe separate introductions before each section or subsection would have helped guide the reader across complex terrain. As it stands, however, the selection and organization of many texts seem very reductive and confusing. While I commend this pioneering effort, I feel that a better organizational and conceptual framework would have made this anthology even stronger. Anderson, Benedict. The Spectre of Comparisons: Nationalism, Southeast Asia and the World. London, New York: Verso, 1998. Print. Barbora, Sanjoy. “Under the Invisibility Cloak: Reimagining the Northeast—Introduction to the Special Section on Northeast India.” biblio-india.org. May-June 2008. Web. 10 December 2012. Guevara, Ernesto. “Message to the Tricontinental.”marxists.org. 1999. Web. 10 December 2012. Laqueur, Walter and Kenneth Alexander (ed.). The Terrorism Reader. New York: Plume, 1987. Print. Mbembe, Achille. “Necropolitics.” trans. Libby Meintjes.Public Culture 15(1), 2003.11-40. Print. —. “What is Postcolonial Thinking?” eurozine.com. 9 January 2008. Web. 10 December 2012. Medovoi, Leerom. “Global Society must be Defended: Biopolitics without Boundaries.” Social Text 91, Vol.25, No.2, Summer 2007. 53-79. Print. Schmitt, Carl. The Nomos of the Earth in the International Law of the Jus Publicum Europeaum. trans. George Ulmen. New York: Telos Press, 2006. Print. —. The Theory of the Partisan: Intermediate Commentary on the Concept of the Political. New York: Telos Press, 2007. Print. The Battle of Algiers. Dir. Gillo Pontecorvo. Perf. Brahim Haggaig, Jean Martin and Saadi Yaacef. Casbah Films, 1966. Film. Whitaker, David (ed.). The Terrorism Reader. London, New York: Routledge, 2012. Print. Amit R. Baishya is Features Editor of Northeast Review. He teaches English at Ball State University in Muncie, Indiana.